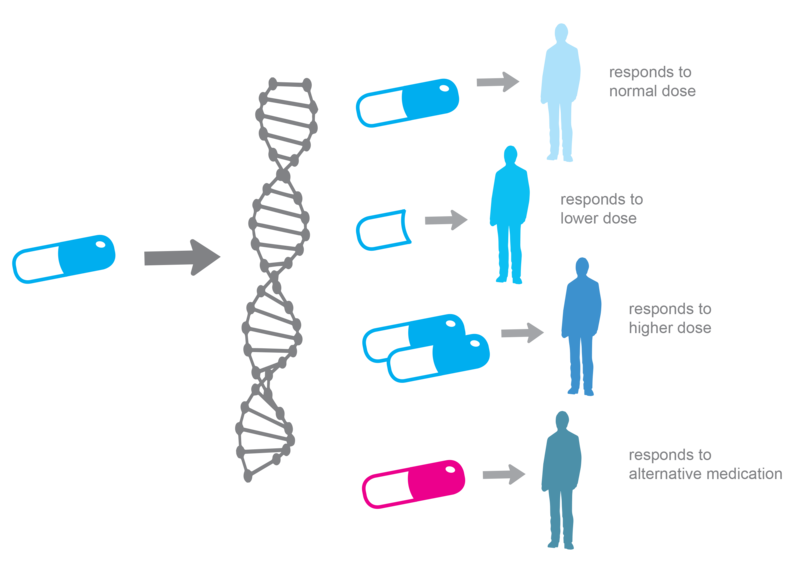 Pharmacogenomics is the study of how a person’s genetic makeup affects that individual’s response to medications. In doing this, it aims to develop a strategy to optimize drug therapies. Data with respect to a patient’s genotype is used to try and maximize drug efficacy while minimizing adverse drug effects and drug-drug interactions. In recent years pharmacogenetic testing (PGT) as a routine clinical tool in patient care has become more commonplace. Advances in technology have made testing more accurate, quicker to implement in a clinical laboratory setting, and less costly. These factors, combined with great strides in our interpretation of genetic data have led to a revolutionary way in how a physician approaches patient care. Recent studies have shown that PGT can decrease healthcare costs while simultaneously improving clinical outcomes. Mitigation of costly trial and error periods when trying to select a new pharmacotherapy, as well as mitigation of costs associated with treating adverse drug events and serious drug interactions, have emerged as a new cost-saving tools in the clinics. THE BENEFITS OF PGT ARE CLEAR —improved patient outcomes when initiating drug regimens, reduced risk of harmful drug-drug interactions and reduced risk of adverse drug events. 82% of American adults take at least one medication and 29% take five or more. (CDC). Adverse Drug Events(ADE) cause over 700,000 emergency department visits each year. (CDC). Nearly 120,000 patients each year need to be hospitalized for further treatment (CDC) . Over 100,000 people die each year due to adverse drug events (FDA). 4th leading cause of death, Ahead of pulmonary disease, diabetes, AIDS, pneumonia, accidents and automobile deaths (FDA). ADEs cause injuries or death in 1 of 5 hospital patients. (New England Journal of Medicine). $3.5 billion is spent on extra medical costs dues to ADEs annually (CDC). ADVERSE DRUG EVENTS ARE PREVENTABLE. Currently, most physicians use “one size fits all” approach. Pharmacogenetics refers to the study of genetic influences on an individual’s response to drugs. In pharmacogenetics, the analysis of a specific gene, or group of genes, may be used to predict responses to a specific drug or class of drugs. Pharmacogenomics refers collectively to all the genes that influence drug responses, and how genome-wide analysis may be used to identify such genes in the search for novel drug targets and/or key determinants of drug reactions.